Caffeine Informer believes that accurate caffeine information must be freely available to all. Research shows that caffeine consumed in moderation can have some positive benefits to most people. 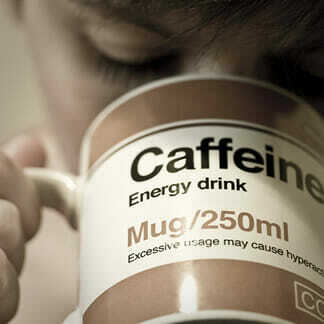 However many others experience negative effects, including withdrawal symptoms when reducing caffeine intake. We believe manufacturers must label caffeine amounts accurately, and tighter regulation of caffeine is needed. Our mission is to inform and educate the consumer about the risks of caffeine, and provide a comprehensive and accurate resource of caffeine amounts. Want an informed opinion regarding caffeine or caffeinated products? Please email Ted Kallmyer for an interview or comment. Please visit this page to find out how. How accurate are the Caffeine Counts? We do our best to track down the manufacturer and persuade them to disclose the caffeine amounts. We also source material from toxicology journals that have tested caffeine in various items (for journal citations go here). Each item in our database lists the source at the bottom of its page. Aren’t Caffeine Amounts Supposed to be Listed on Drinks? The US FDA requires caffeine to be listed on the ingredients list, but, as caffeine is not a “nutrient” the exact amount does not have to be listed (FDA). That is why we maintain the caffeine database. In 1958 the FDA placed caffeine on its GRAS (Generally Recognized As Safe) list. It suggests a dosage of no more than 400mg per day. Most health authorities believe that pregnant women should consume no more than 200mg caffeine per day. Are There Limits On How Much Caffeine Is Allowed in Beverages? The FDA rules are out of date, and never anticipated the proliferation of highly-caffeinated products that are currently available. There are no strict limits – unlike other countries, such as New Zealand and Australia that limit caffeine amounts to 32mg per 100 mls of drink. Does This Site Have A Bias In Any Way? Can Caffeine Really Kill You? Yes it can. We made the Death by Caffeine calculator as a fun tool to highlight the levels of caffeine in drinks. It is also a serious reminder of the toxicity of caffeine in higher dosages. People have died after overdosing on caffeine pills, and over-consumption of high-caffeinated energy drinks has made headlines over the last few years. Ted is our caffeine expert and previous to working at Caffeine Informer spent 12 years as a biology/ health educator for the public school system. He is a healthy eating and exercise advocate and loves educating people about what’s in the food they are eating and how to live healthier lives. Ted is based in Oregon, USA. James manages the site having been a writer and blogger for a number of web sites for over a decade. He also writes for the electric vehicle blog EV Rater. He is based in New Zealand.